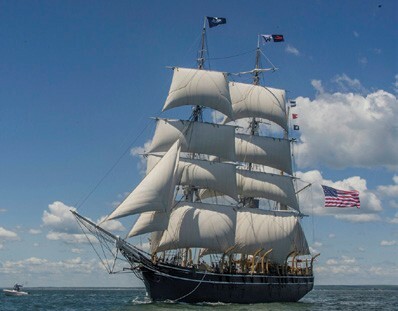 The 1841 whaleship Charles W. Morgan sailed for the first time in almost a century on Saturday, June 7, on the first day of sea trials for her 38th Voyage. The ship cast off from City Pier in New London, CT and proceeded onto Long Island Sound, where her crew conducted sail training drills and maneuvers. The Morgan has been at Mystic Seaport in Mystic, CT since 1941, and has not sailed since her last whaling voyage in 1921. She embarked on her 38th Voyage in June, visiting Newport, RI and Vineyard Haven and New Bedford, MA. She’s open to the public on New Bedford’s State Pier until July 6. She’ll anchor off Provincetown, MA from July 11 – 13, with day sails to the Stellwagen Bank National Marine Sanctuary, where she will team up with the National Oceanic and Atmospheric Administration (NOAA) to observe whales in their natural environment and call attention to mankind’s changing relationship with the natural world. She’ll be open to the public July 18 – 22 at Charlestown Navy Yard in Boston, and July 26 & 27 at Massachusetts Maritime Academy in Buzzards Bay, MA. A homecoming celebration at Mystic Seaport is August 9. Visit mysticseaport.org/38thvoyage for more information.